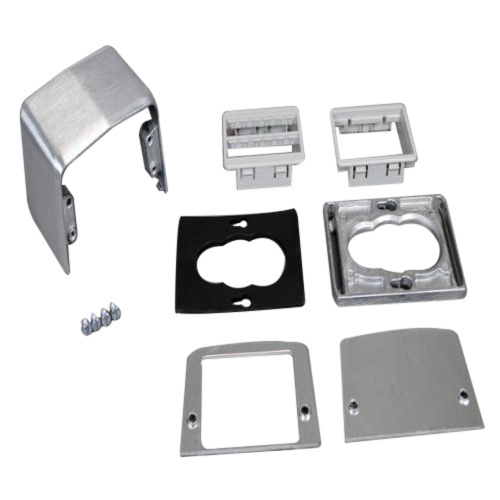 Wiremold 525 Series 4-Piece rectangular communication service fitting features die-cast aluminum construction with brushed satin finish for utmost durability. It has a dimension of 4-7/16-Inch x 3-1/8-Inch x 3-Inch. This line of fittings is suitable for use in schools, commercial office spaces and in labs. The service fitting is compatible with Walkerduct® Pro series, Walkerduct® underfloor duct, Flushduct® and walker 800 series floor boxes as well as Extron® Electronics and Ortronics® audio/video devices. This flexible four-piece design fitting accommodates two removable faceplates including blank, power and communication styles. The fitting includes faceplate with opening, one side, Ortronics Series II and TracJack adapters. Service fitting is UL listed and RoHS compliant.